I was re-watching the amazing spider-man movie when I saw his cool door lock system, I thought I would create my own but make it a little different. For example, he uses a linear actuator to lock the door; which uses gears, and I am using a solenoid valve actuator that uses electromagnetism via a inductor coil. First I would like to show you my circuit, I created this at skemit.com and downloaded it as an image file. Some of the symbols were missing, so I had to make do with similar symbols. A1 is the solenoid I purchased off eBay. S1 and S2 are two switches in parallel that will override the relay which is normally operated by the wireless key fob. S1 is the main manual trigger switch on the lock unit itself and S2 is a fail-safe reed switch that will be hot glued inside of the exterior door handle. If I happen to lose the key fob I can still power the solenoid, thus unlocking door by putting a magnet on or near the door handle. 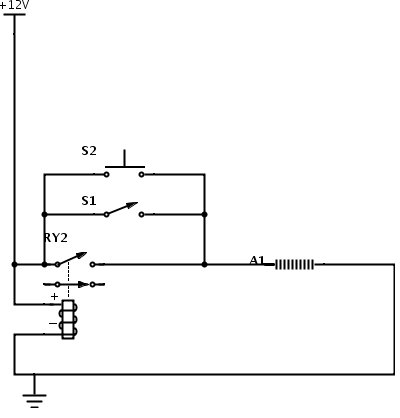 This will close the reed switch and complete the solenoid circuit. Since the solenoid requires power from a transformer and in turn 'the sockets', they will need to be energised. I will probably add a battery backup to take over when power is out, but for now if I have to climb a ladder to get in, so be it.